You can listen to the Light Side (Part I) and Dark Side (Part II) of our Force Awakens discussion. 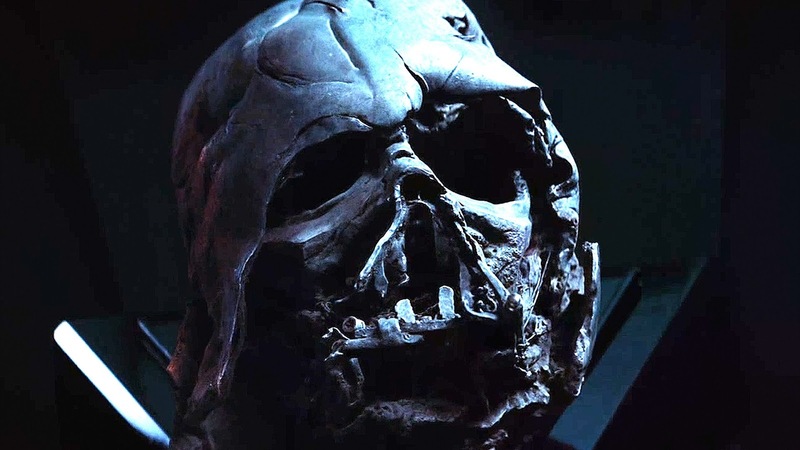 And for our Force Awakens commentary track, click here. Star Wars fans are a fickle bunch. We demonized the prequels for looking and feeling too foreign to the canon, and now we're complaining that The Force Awakens repeats too many beats from the original trilogy. Sure, Starkiller Base is just Death Star III. Jakku is Tatooine in all but name. Hell, Han Solo's death scene is built to mirror Obi-Wan Kenobi's almost exactly. But these thematic echos connect us to our past and introduce us to the future. They lend credibility and verisimilitude to the new characters and locations. They assure us that this is still the Star Wars we know and love. 1. "Rey has expert Force powers without any training!" Early trailers made it clear that Rey is the sequel trilogy's Luke Skywalker. Not only is she a white-cloaked desert orphan, but she shares Luke's essential heroic trait: empathy. 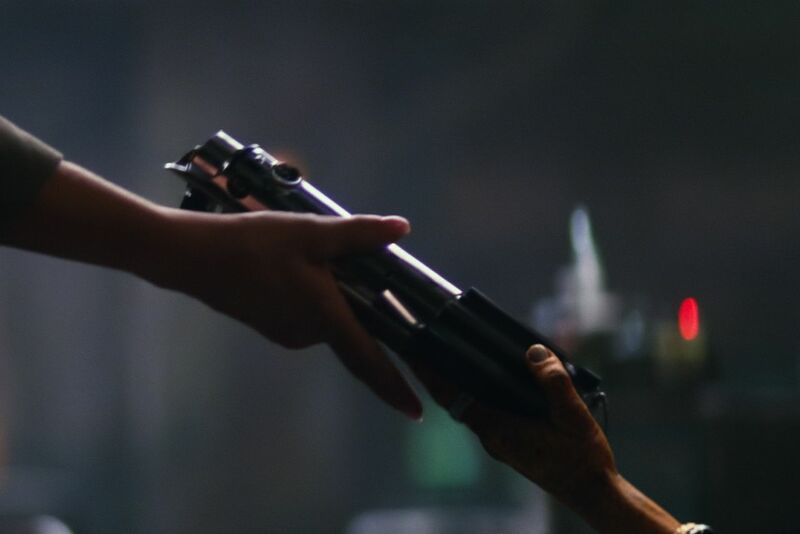 Rey's establishing character moment comes when she refuses to sell BB-8 for a hefty reward. She feels a kinship with the droid, one born of a shared feeling of abandonment. It's this search for belonging that calls her to adventure. Rey is denying something, pushing back against an insecurity that confronts her when she embraces Luke's lightsaber. That moment is her apotheosis, the point in Campbellian myth when the hero transcends her previous station and rises to a new plane of existence. She's been activated, awakened. It's here that she sets upon a path blazed by Luke decades before and her thematic connection to him becomes clear. Awakenings aside, Rey engages in some pretty hefty Force antics pretty damn fast. Now, I won't argue that it isn't jarring or unexpected. The Force Awakens had a lot to do, and it just barely justified this development in the third act. But really, how far along was Luke when he destroyed the Death Star? He hadn't met Yoda yet. He'd had one lesson from Obi-Wan: reach out with your feelings and act on instinct. It's the exact same advice Maz Katana gives Rey. Quieting her mind and trusting her feelings allows Rey to push back against Kylo Ren's mind probe and coax a stormtrooper into releasing her. See, the beauty of The Force Awakens is that it returns the Force to its mystical origins. No one tests Rey's midi-chloreans. She never stands before the Jedi Council. The Force responds to those who listen for it, and a number of scenes in The Force Awakens feature Rey closing her eyes and feeling the Force. If Luke can destroy a battle station with the Force after a day and a half of study, surely Rey can swing a lightsaber around a bit. 2. "Kylo Ren is weak and ineffective!" 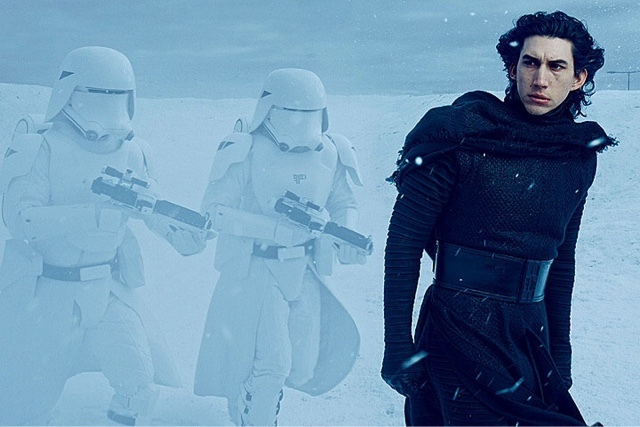 Kylo Ren may be the most interesting character in The Force Awakens. He's a legacy Force user, the nephew of one powerful Jedi and grandson of another. But at some point, Ben Solo lost his way. The Force Awakens deftly avoids too much exposition here, but it's easy to see what drove him to the Dark Side. Perhaps he felt abandoned when his parents shipped him to Luke for training. Perhaps he inherited his grandfather's rage and insecurity. We've seen enough Star Wars to understand the power of the Dark Side and why Ren regards Darth Vader as a god. In fact, his gross misunderstanding of his grandfather's legacy is the groundwork for the redemption story that will likely define the sequel trilogy. But try as he might, we say, Kylo Ren is no Darth Vader. He's petulant and childish, the jealous black sheep of the First Order. He jockeys for position against General Hux and cries desperately for Supreme Leader Snoke's approval. He spends most of the film frustrated by failure and anxiety, throwing temper tantrums and punishing his subordinates. He's deeply disturbed by a new awakening in the Force and ruthless in the murder of an old mentor. He is, of course, exactly where Darth Vader was in A New Hope. Those who were disappointed by Kylo Ren's villainy are forgetting that Darth Vader was a childish and ineffectual lapdog in the first Star Wars film. His lieutenants made fun of his religion and his boss scolded him for failing to recover the Death Star plans. He choked people and tortured a princess. He only defeated Obi-Wan in battle because the old Jedi sacrificed himself to allow Luke to escape. Despite being the best star pilot in the galaxy, Vader is easily crippled by a few blasts from the Millennium Falcon. It's not until The Empire Strikes Back that he finds his true purpose and becomes the fearsome villain we've all come to know. With this in mind, imagine where Kylo Ren (beaten, emasculated, and embarrassed at the end of Awakens) will be in Episode VIII. 3. "The whole plot was a series of coincidences!" J.J. Abrams has never been too concerned with narrative propulsion. Like Spielberg before him, he understands that engrossing an audience is more useful to a filmmaker than plot causality and logic. And it's true, The Force Awakens suffers from many of the problems that Abrams is famous for: an overstuffed cast, "unearned" character beats, and complete lapses in good sense. Awakens is much more an entertaining film than a great one. Leia's old ally just happens to reside on Jakku, where Rey also just happens to live. 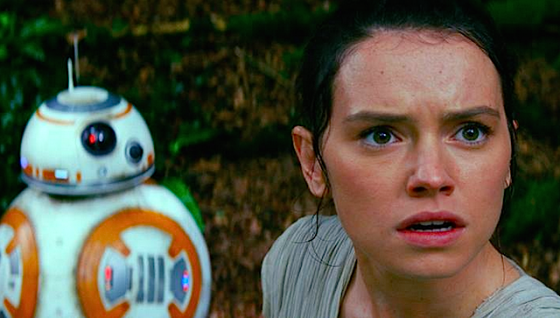 BB-8 just happens to run into Rey, the Force-sensitive orphan with an as-yet-unknown connection to the Skywalkers. She happens to run into Finn, who just happens to be the stormtrooper assigned to guard Poe. They just happen to find the Millennium Falcon, and Han Solo just happens to be floating around nearby to recover it. Maz Katana just happens to have Luke's saber in her basement. I could go on. But let's consider A New Hope. The droids just happen to land on the portion of Tatooine closest to Luke. * The right set of Jawas just happen to pick them up. R5-D4 just happens to have a bad motivator, allowing R2-D2 to meet Luke Skywalker, just the man he needs (even though he doesn't know he needs him). Obi-Wan Kenobi just happens to be roaming the Jundland Wastes of Tatooine around the time Luke is looking for him. Wait, why didn't the Imperial gunner waste one round of ammunition on that escape pod? Anyway, I could go on. The point is, coincidences just happen to connect stories together sometimes. No, it's not the strongest narrative model. A good plot has cause and effect, characters pursuing goals that reflect their internal needs. I'd never argue that The Force Awakens has a plot anywhere near as structured or causal as A New Hope. But there is an element of discovery inherent in the journeys of Luke, Finn, and Rey, and there's something to be said for allowing an audience to feel that discovery as well. There's something to be said for, instead of writing a ten-minute scene of filler dialogue between Finn and Rey that serves only to make Han Solo's appearance more logical, the filmmakers choosing to get on with it so we can have ten more minutes with Kylo Ren. It's not a logical computer program, it's Star Wars. *Yes, I know planets in Star Wars are essentially one city and one environment. That doesn't make me wrong.